In a large mixing bowl combine 3 1/2 cups of flour and yeast. In saucepan heat milk, sugar, butter and salt until warm (115-120°). Stir constantly to melt butter. Beat at low speed with electronic mixer for 1/2 minutes. Scraping sides of bowl constantly. Turn out onto a floured surface and knead till smooth and elastic (about 5 to 8 minutes). Place in lightly greased bowl, turning once to grease surface of dough. 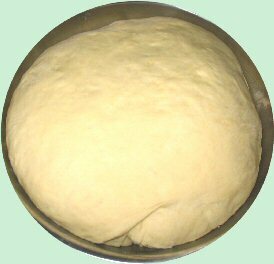 When the dough has risen, punch dough down and turn out onto a lightly floured surface. Divide into thirds. These will become your 3 rolled cinnamon loaves. Cover each section; and let rest for 10 minutes. Combine the 1/2 cup of sugar and the ground cinnamon in a small bowl. You’re going to divide this mix into thirds, one for each loaf. After the 10 minutes, lightly flour your rolling pin and use it to flatten each loaf section into a 15×7 rectangular sheet. About 1/4 inch thick. Brush only the side facing up with a melted butter wash.
Sprinkler the cinnamon mix over each sheet of dough. Roll the sheets up to make your loaf, beginning with the narrow edge of the rectangle. Gently pinch the end into the loaf to seal. Pat the ends to help seal for the hull of the loaf. Place, sealed edge down, in a greased bread loaf pan. 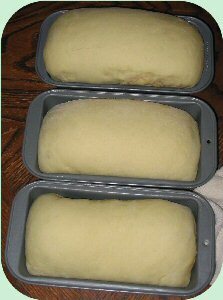 Cover and let rise in a warm place till each loaf has almost doubled in size. (approx. 35 to 45 minutes). If crust browns to quickly; cover with foil for the last 15 minutes of baking. When done, turn each loaf out of bread pan and let cool on a wire rack. Make sure you cool each loaf on it’s bottom side. * If the dough doesn’t rise after 1 1/2 hours, something went wrong and it won’t rise at all. Go ahead and make the rolls, but they’ll be thick and heavy instead of light and fluffy. Combine ingredients in a small dish. Make sure bread is lightly warm to the touch. Too hot and you’ll melt the icing off the top. 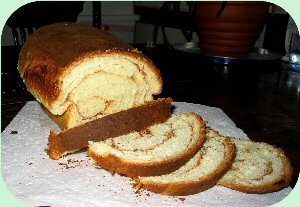 Place cinnamon loaf onto a large piece of wax paper. With a spoon, drizzle icing back and forth across the loaf. Make a decorative pattern, or top with nuts, fruits or other decoration before icing cools.